She's coming to Times Square this fall, complete with wax selfie stick. Quite the mid-summer day for Internet sensation Jenna Marbles. On the West Coast, at VidCon in Anaheim, she will be part of this afternoon’s panel “Laughing At & With Us.” Moderated by Sean Klitzner, the discussion will also feature GloZell, Craig Benzine, Miranda Sings, Mamrie Hart and Danisnotonfire. Per usual, the creation of the figure is an expensive and intricate process. When a team of Madame Tussauds studio artists met with Marbles in California in May, they took more than 250 measurements. And yes, in her outstreched hand, there will be a Tussauds phone powered up and ready to snap a selfie of attraction visitors. 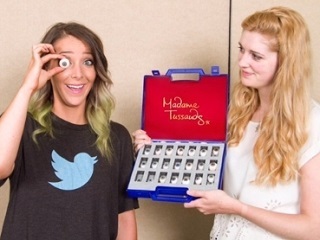 Marbles is in fact the second “social media celebrity” to get the Tusssauds wax figure nod. Post-publication, we learned that a wax figures of SMOSH duo Anthony Padilla and Ian Hecox was separately and previously commissioned, in connection with the pair’s new movie. FishbowlNY apologizes for the error.